The No. 45 wins Laguna Seca - the No. 45 drivers take the GT2 drivers' championship and the team wins the team championship. Congratulations to the Lizards!! 6:50 - At the final turn, the No. 3 Corvette bumped hard into the back of the No. 45. Joerg held his position, but the No. 3 pushed in on the inside. Both cars moved to cross the finish line first. The No. 3 moved to pass on the inside next to the concrete pit wall, then crossed the track to impact the far wall. Joerg crossed the finish line first. 6:46 -Just a few turns to go - Joerg in the lead but the No. 3 right behind trying everyrthing he can to get by. Through the corkscrew. 6:43 -- The No. 3 went through pit lane to pass Joerg on the front straight. Although he took the lead, race control notifies us that he has to let the No. 45 back by. 6:41 - The No. 45 and the No. 3 split again on either side of the Ford, with Jeorg on the inside - Joerg was able to stay ahead by navigating by a Challenge car. 4 minutes left. 6:39 - Aacck. Bumper cars on track as the No. 3 passes, then Joerg retakes him and the No. 3 bumps him. Joerg kept control and is still ahead. 6:38 - The No. 3 is right on Joerg's bumper.Joeg is pushing as hard as he can and is staying ahead. 6:35 - We watched Joerg nearly get taken out by the No. 15 as the No. 15 wobbled going onto the front straight. Luckily the No. 15 recovered and Joerg was able to avoid hitting him. Unfortunately Joerg flat spotted the tires. The No. 3 is right behind him. 6:33 - The gap is now 3.5. It is going to be very close. 11 minutes left. 6:32 - The No. 3 Corvette is now 5 seconds back from Joerg. 6:30 - 15 minutes left. Joerg is in the lead, the No. 3 is 7 seconds back. Both cars should be able to complete the race without stopping again. the No. 3 has slowly been closing the lap to him and Joerg but he is running out of time. Night is falling and visibility is getting low. 6:27 - Positions: P1 No. 45; P2 No. 3; P3 No. 87; P4 No. 21; P5 No. 12; P6 No. 44. 6:25 - The No. 3 just went off but recovered - he lost a second or so. 20 minutes left. About 12 laps left. 6:22 - The No. 3 Corvette has closed the gap further. Jan Magnussen just did a 1:23.963. He is now 7 seconds back from Joerg. 6:19 - 17 laps to go. The No. 3 is pushing hard - it is now the fastest car on the track and for the last few laps was 1 second faster than Joerg. Joerg is also pushing hard and is matching the pace. 6:16 - The No. 48 prototype has a puncture and is slow through Turn 6 and is continuing slowly. He is starting to lose bodywork from the rear puncture. Joerg radios in that his right rear tire is dropping pressure. In the No. 44, Johannes moves to P6. Positions: P1 No. 45; P2 No. 3; P3 No. 87; P4 No. 21; P5 No. 18, P6 No. 44. In the No. 3, Jan Magnussen is alowly closing the lead to Joerg slowly - he is now 10 seconds back. 6:10 pm - Joerg is still in the lead in the No. 45, ahead of the No. 3 Corvette, with an 11 second gap. Johannes is in P7 in the No. 44. 6:00 pm - 45 minutes left. Positions: P1 No. 45; P2 No. 3; P3 No. 87; P4 No. 21; P5 No. 92; P 6 No. 18; P 7 No. 44. 5:57 - the No. 87 is in the pits for their pit stop - looks like tires and fuel but Wolf Henzler will stay in the car. Joerg retakes the lead and is now 14 seconds ahead of the No. 3 Corvette, which is P2. 5:53 - Patrick is in the pits for tires, fuel and driver change to Joerg Bergmeister. He is in the lead. 5:50 - Patrick still P1 in the No. 45. 7 seconds ahead of the No. 3 Corvette in P2. He will pit in 2 laps or so. 5:41 - 7 or 8 laps before the No. 45 pits for driver change back to Joerg. Positions: P1 No. 45; P2 No. 3; P3 No. 87; P4 No. 21; P5 No. 18; P6 No. 44. Just over an hour to go in the race. 5:26 pm - Patrick remains in the lead. He is 10 seconds ahead of the No. 3 in P2. If all goes as planned, the No. 45 will pit in 20-25 minutes for a driver change to Joerg Bergmeister. To recap for those just joining, Flying Lizard has won the GT2 Drivers' and Team championships. Risi retired from the race. We went into the race 19 points ahead, so no matter where we finish in the race, we will win both championships. 5:19 - The No. 44 made contact with the No. 18 but Johannes was able to continue and doesn't think there is damage to the car. Johannes is currently P5. 5:17 - The No. 4 Corvette is pitting with a puncture and damage to the right front after contact with the No. 16 Mazda prototype. He is in the pits for a new wheel and quickly back out again. The No. 4 is far down in the field after being involved in a multi-car incident early in the race. 5:15 - 90 minutes left to go. Patrick Long, doing a double stint, retains the lead. The No. 44 is sixth. The No. 3 Corvette is P2, the No. 18 Vici Racing Porsche P3, and the No. 87 Farbacher Loles Racing Porsche is P4. The No. 62 Risi Competizione Ferrari has retired - the Lizards have won both team and drivers' championships - 2 years in a row. 5:07 - The NO. 3 Corvette overtook the No. 18 Vici Racing Porsche who went to the outside and dropped a wheel off. The No. 18 was able to recover, but the No. 3 Corvette was by. The No. 3 is now P2. 5:05 - The No. 18 Vici Racing Porsche in second is working hard to hold off the No. 3Corvette in P3. In the No. 45, Patrick is in the lead and has a 10 second lead on the No. 18. The No. 44 is in P7. 4:55 - Positions: P1 No. 45; P2 No. 18; P3 No. 3; P4 No. 21; P5 No. 87; P6 No. 92; P7 No. 44. 4:54 - The Vici Racing Porsche with Richard Westbrook behind the wheel passed the No. 3 Corvette to take second. The No. 21 is fourth. 4:50 - Green flag. Great restart for Patrick - he was able to manage a huge amount of traffic and get a gap to the No. 3 Corvette, which is P2. 4:45 - Nearing the halway point, Patrick Long in the No. 45 now in the lead. 4:42 - Positions: P1 No. 87; P2 No. 45; P3 No.3; P4 No. 21; P5 No.18; P6 No. 92. The first five cars are on the same lap. The No. 92 is one lap down. The No. 44 is pitting for driver change, tires and fuel. The No. 87 pits, which puts us P1. 4:36 - the No. 45 pitted immediately after the pits open and Patrick is out again on track quickly after a seamless stop for tires and short fuel. The No. 3 Corvette also pitted, but the No. 45 was out of the pits first, gaining a position. He is now P2 - the No. 87 did not pit and it looks like they now have the lead. The No. 44 has not yet pitted, but they will at the end of the yellow. 4:34 - STill yellow. Positions: P1 No. 3; P2 No. 21; P3 No. 45; P4 No. 18; P5 No. 87. No. 44 is P7. Pits are open and both cars are called into the pits. The No. 45 will do a short fuel and tires only. The No. 44 will do tires, fuel, and driver change from Seth Neiman to Johannes van Overbeek. 4:31 - Seth reports a flat spot on the front tire. He is close to the window for driver change back to Johannes but needs him to stay out a few more minutes. Joerg and Johannes are hustling to get ready for possible driver changes. Patrick radios in that he is OK, that he can double stint. Seth will pit for driver change to Johannes. 4:22 - With the championship now secure, chief strategist Thomas Blam notifies Patrick Long that he can push - he's in P3 right now, and the No. 18 Vici Porsche is close behind in P4. No. 3 Corvette is P1; No. 21 Panoz in P2. 4:21 - Two challenge cars are off at Turn 3 - one is continuing, one remains off track in the gravel. 4:19 - Seth radios in that he was just hit by the Autocon Prototype. he is continuing, but can't tell yet if any damage to the car. 4:15 - 90 minutes into the race: P1 No. 3; P2 No. 21; P3 No. 45; P4 No. 18; P5 No. 17. No. 44 is P8. It looks like Risi may retire the No. 62, which means that the No. 45 and Flying Lizard will win the drivers and team championships. 4:14 - The No. 62 is going behind the wall and they don't appear to be in a hurry. the No. 21 has passed the No. 45 to take second. The No. 45 will focus on finishing the race, tenth or better, they do not want to take any unecessary risks. 4:11 - Positions: P1 No. 3; P2 No. 45; P3 No. 21; P4 No. 18; P5 No. 17; P6 No. 87. No. 44 is P8. The No. 62 is still in the pits. 4:08 - We think that the No. 62 Risi Ferrari hit the No. 33 car and damaged the radiator - we can see water. Yes, the No. 62 has some issue - they are pitting. They were in the lead at the time. This puts the No. 3 Corvette into the lead and the No. 45 into P2. 4:04 - The No. 4 Corvette is in the pits for a stop and go penalty - not sure what that was for, but they are back out again. The No. 33 Jaguar and No. 47 Challenge car also served penalties and are back out again. There is a second penalty on the NO. 4 car for avoidable contact in the earlier incident with the Challenge cars and theNo. 92 BMW - this is a stop and go plus one minute. So they will be back in on the next lap. 3:49 - The No. 45 has moved to P3, passing the No. 17 Falken Tire Porsche, which did not pit earlier. Positions: P1 No. 62; P2 No. 3; P3 No. 45; P4 No. 17. P5 No. 21. No. 44 is P9. The No. 4 Corvette was involved in an earlier incdident and spent some time in the pits and have now fallen back to the back of the pack. 3:45 - Green flag but in the restrart huge incident with multiple cars off in Turn 2, including the No. 4 Corvette, and the No. 92 BMW, which is now is disabled on track. Yellow flag. The No. 4 was able to continue back into the pits but has substantial front end damage. Both Lizard cars were able to avoid the damage (the No. 44 was in front, the No. 45 in back.) The No. 92 has restarted and returned to the pits. We are now P4. Positions: P1 No. 62; P2 No. 17; P3 No.3: P4 No. 45; P4 No. 21. No. 44 is P8. 3:37 - Pits are open, stategist Thomas Blam calls the No. 45 in and Eric Ingraham calls No. 44 in. The First six GT2 cars all pitted. Driver change in the No. 45 to Patrick Long. Driver change in the No. 44 to Seth Neiman. We beat the No. 87 Farnbacher Loles Porsche out of the pits. We believe that the No. 62 Ferrari did not take tires, nore did the No. 92 BMW. The No. 40 and No. 17 did not pit. So the No. 40 has moved to P1 (since they did not pit), followed by the No. 17 in P2. The No. 62 Ferrari is now P3, the No. 92 BMW is P4. The No. 4 and No. 3 Corvettes, which both took tires and fuel, are P5 and P6. The No. 87 is now P8. The No. 44 is P9. 3:37 - Pits are open, stategist Thomas Blam calls the No. 45 in and Eric Ingraham calls No. 44 in. The First six GT2 cars all pitted. 3:34 - Double yellows. The cars are staying out, should pit at the end of the yellow. The cars cannot pass under yellow. Positions: P1 No. 3; P2No. 4; P3 No. 62; P4 No. 87; P5 No. 45. The No. 20 Dyson prototype is parked off course - I thought I heard something about running out of fuel, but I can't confirm that. 3:33 - No. 08 Patron Challenge Porsche is in the gravel - may go double yellow. The drivers are getting ready for possible drivers changes. I expect both cars will pit late in the yellow. 3:26 - GT2 top positions remain the same: P1 No. 3; P2 No. 4; P3 No. 62; P4 No. 87; P5 No. 45; No. 44 is P9. Johannes is stuck behind the No. 92 BMW, which is behind the No. 40 Ford. Joerg and Patrick in the No. 45 are 19 points ahead of Jaime Melo and Pierre Kaffer in the No. 62. If the No. 45 finishes tenth or better, they will win the championship, no matter where Risi finishes. If the No. 45 does not finish the reuqired 70 % of the overall winners race length, they can still win if Risi finishes third or worse (first place at Laguna is worth 25, third is worth 18). 3:20 - The top GT2 cars are all running a similar pace. Joerg, in fifth, is right behind Wolf Henzler in the No. 87 Farnbacher Loles Racing Porsche. The two Corvettes and the Risi Ferrari are all running together and have a 3 second gap to the No. 87. 3:14 pm - Lead GT2 psoitions remain the same - the Corvettes and the Ferarri have pulled a few seconds ahead of the No. 87 in P4 and the No. 45 in P5. In the No. 44, Johannes is now P9. The group is threading through a clutch of slower Challenge cars. 3:03 - The No. 20 prototype is in the pits for an unscheduled stop. 3:02 - Green flag. GT2 lead positions remain unchanged but they have packed back up into a bunch. P1 No. 3; P2 No. 4; P3 No. 62; P 3 No. 87; P4 No. 45. No. 4 is P10. 2:51 - The incident was between the No. 88 Drayson prototype and the No. 5 Musclemilk Porsche Spyder. Both cars are i nthe gravel. No. 88 had a hard hit. Paul Drayson was driving - he is out of hte car and we can see him on camera talking to the officials. The No. 90 BMW appears to have a major problem and is smoking in the pits. 2:47 - Positions: P1 No. 3; P2 No 4; P3 No. 62; P4 No. 87; P5 No. 45. Johannes has moved back up to P13. The two Corvettes have built a bit of a gap to the rest of the GT2 field. The No. 87, in fourth, is putting a lot of pressure on the No. 62 in third. Major incident with tow cars at Turn 9 - double yellow. 2:40 - Engine start - cars are rolling on their pace laps. The No. 44 spun on the pace lap and unfortunately, has to stay at the position he is at after the spin. The track and tires are very cold and it is extremely slippery. I don't know what position he is at right now - but I'll report in a minute. I expect he is at or near the back of the pack -this means that he'll have to fight his way through the Challenge car traffic to get back to the GT2 field. 2:38 pm - Reminder that we are broadcasting our team radio during the race. 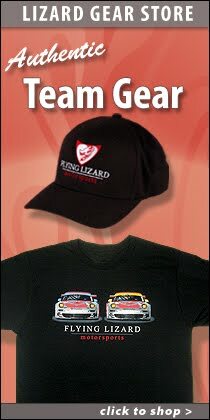 To listen, to to the "Follow the Race" Tab on the www.lizardms.com team page. Internet connection here is a bit dicey because of the fog, so if you can't connect, try again in a few minutes. 2:32 pm PT - Good afternoon from Laguna Seca. The cars are on the grid and we are just few minutes from the pace lap. Lizards will start fifth and thirteenth on the GT2 grid. Joerg Bergmeister is starting in the No. 45 and Johannes van Overbeek in the No. 44. 10:10 - Checkered flag on the morning warmup. Patrick Long was second fastest in the session,the No. 90 BMW was P1. The No. 44 was 7th. Both Lizard cars will head back into the garages for final prep before the race. Recon laps begin at 1:45, race starts at 2:45. The race will be broadcast tape-delayed tomorrow, Sunday, starting at 11:30 am PT. 9:58 - Both Lizard Porsches are back in the pits. The No. 44 is done for the session, Patrick will go out again briefly in the No. 45. The No. 44 crew will practice driver and tire changes in the pits for the next 10 minutes of the session. The race begins at 2:45 pm PT. Joerg is currently fifth in the session and Johannes is seventh. 9:50 am PT - Good morning from Laguna Seca. Both Flying Lizard cars are out for morning warmup. It's quite cool here and foggy. Because it's so cold, there won't be much opportunity to do any setup work. The drivers will use the first part of the session to warmup the tires and do a shakedown on the cars. Johannes van Overbeek is in the No. 44 and Joerg Bermgmeister is in the No. 45. We are broadcasting our team radio today - for this morning's wamup and for the race this afternoon. You can listen in at the website - click on the "Follow the race" page.